As well as advertising in local newspapers and cinema programmes flyers or leaflets were also sometimes produced and handed out to cinema goers to advertise current and pre- release films. Many of these have been lost and thrown away over the years. Below is a scanned copy of a flyer handed out to cinemagoers advertising films from March 1961. 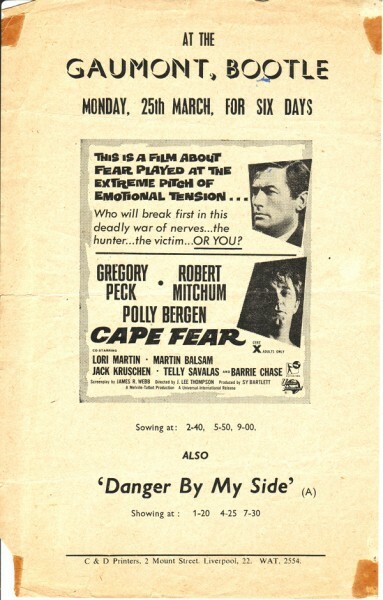 The films showing in the cinema at that time were ’Cape Fear,’ the main attraction and also ‘Danger by my Side’. This flyer was distributed at the Bootle Gaumont Cinema and has been stored for over 50 years. The film ‘Cape Fear’ starred Gregory Peck and Robert Mitchum, and was subsequently remade in 1991, starring Robert DeNiro and Nick Nolte. The original film received an ‘X’certificate on release but it is regularly shown on television, however on the film’s DVD release it was given a 15 certificate.